Automation in the Virtual Testing of Mechanical Systems: Theories and Implementation Techniques provides a practical understanding of Knowledge-Based Engineering (KBE), an approach that is driving automation in engineering. Companies are using the technology to automate engineering tasks, achieving gains in output, and saving time. This book will be the main source of information available for implementing KBE systems, integrating KBE with the finite element methods, and showing how KBE is used to automate engineering and analysis of mechanical systems. The process of combining KBE with optimization techniques is explored, and the use of software tools is presented in some detail. Introduction. State-Of-The-Art Knowledge-Based Engineering. State-Of-The-Art FE-based Dynamic Simulation. Framework for Generic Mechanism Modeling. Design Optimization. Environment for Design Automation. Interaction with the User. Automated Design Cases. Ole Ivar Sivertsen is a Professor of Mechanical Engineering at NTNU in Norway, where he served as department head from 1996 to 1998, and from 2007 to 2012, and also as study program head from 2004 to 2013. He is the originator of the simulation software FEDEM, which was developed in national and international research projects and commercialized through the Fedem Technology Company. Dr. Sivertsen is author of the book “Virtual Testing of Mechanical Systems, Theories and Techniques”, published by CRC Press in 2001. His latest research focuses on the topic of Knowledge-Based Engineering (KBE). Bjørn Haugen is an Associate Professor in Mechanical Engineering at NTNU in Norway. His educational background is in Civil and Aerospace Engineering Sciences, and his main research topics are finite element methods with application to structural mechanics, elastic mechanisms, and tribology. Dr. Haugen's industry experience includes development of engineering analysis software at Fedem Technolgy Inc., and in biomedical software at HYTEC Inc.
"…this work will be an excellent exposition and guide for modern machine system design. For too long machine design has been treated as an art that could not be systematically learned or applied. I suspect that many machine designers will be interested, and that it will also be embraced by the academic community as a long-awaited text for teaching these subjects. 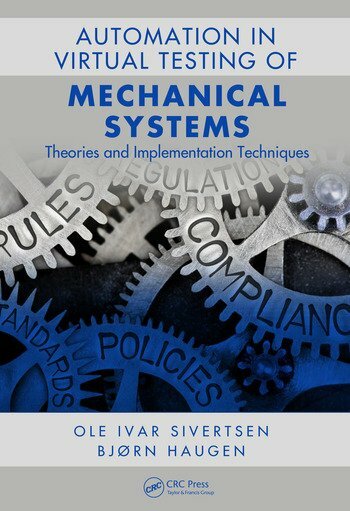 Sivertsen and Haugen’s book has the potential to become the forerunner of a new genre of Mechanical Engineering Design references and textbooks."